Blog — Save the Rhinos, Respect the Horn! "Surf more, stress less. Do good. Save the rhinos, wear something that matters"
As I walked throuh the streets of Manhattan this past Thursday night I focused on absorbing what was happening all around me. The people, the smells, the feeling of the air and little drizzle of rain. The feeling of the concrete beneath my feet, the sounds of my boots each step I took. So many lights, so many signs demanding attention. Its always hard, especially when leaving Penn Station, as it's a guarantee to see someone, many someone's, living off the streets most of which I'd expect are genuinely in need. This night I see another young man sitting with his head down - he is holding a sign too but not as remarkable the LCD billboards that shine down on him. His is just asking for help, asking for money on his birthday. Immediately I wonder if it is in fact his birthday or an attempt to generate empathy and open wallets and purses. Doesn't really matter, he's definitely in need -we all are. I look around at so many faces and wonder if they see him or pretend not to. I wonder how much cash is in all these pockets and if it would even help the problem. It just seems like everyone is focused on getting to their destination, their conversation, their site seeing pictures, their phones... we have tunnel vision syndrome. As I keep walking I feel a heaviness setting in as my inner voice casts blame down upon me for looking at others to do what I should do myself. I remind myself I cannot judge. But how can I help? I wonder if I could make mockup signs & flashing mini marquees and set them up around the homeless or those asking for help if people would pay more attention then. Maybe it would get into the news and maybe that could help people look around more. 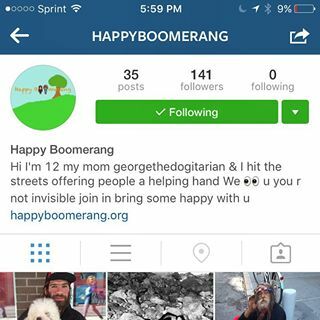 I think of @skidrobot out in LA and his art activism for the homeless and also @happyboomerang - a mom & son in NYC that take their dog to visit and give to those in need. We need more of this. Its hard to stay focused with so many fronts to deal with not only just issues but working through the challenges of daily life itself. As I walk further though the streets I work on focusing on the positives, think about ideas, and remind myself that I'm growing because I am seeing more and more of what is really around me instead of seeing only what I want to see. I feel hopeful even in the face of tremendous strain and challenges. And I reset my intention to be more mindful, more open, to Walk in Beauty. And next time even if I am late I'll stop and acknowledge even just one person, even if all I can do is look into their eyes and say hello. And so I continue to wonder in awe of the beauty around me and wonder how I might somehow be a more vibrant part of it all. I have to be more open, open my eyes, mind, and heart wider. I must be more honest with myself and the world everyday. The plants of the desert grow the deepest roots. When sorrow walked with me." The death toll from the weekend’s rhino killings at Hluhluwe-iMfolozi Park (HiP) in KwaZulu-Natal has risen to eight, with one survivor. The three separate incidents occurred in three different areas of the Hluhluwe section of the park,Zululand Observer reported. “In one incident, two rhinos were shot and dehorned on the Corridor Road while in another, five rhino were darted on the road to Hilltop Camp. It is one of these that survived,” said Ezemvelo KZN Wildlife spokesperson Musa Mntambo. The third incident occurred in the far northwest of the park, in which two rhino were shot. Mntambo said authorities were confident the surviving rhino would make a full recovery and was yesterday taken to the park’s secure bomas. According to Mntambo, no weapons have been recovered from any of the crime scenes, but the KwaJobe Community Forum apprehended one suspected poacher yesterday. At this stage it is unknown whether or not the suspect is linked to the weekend’s poaching incidents. This after five white rhino were killed and two others survived dehorning in less than two weeks at the same park late last month and early September. Rangers found the carcass and also two dehorned, dazed rhinos and a calf that survived the poaching incident. At the time, Mntambo said the rhino were possibly darted. Speaking during last week’s World Rhino Day, Ken Maggs, chief of staff at ranger services at the Kruger National Park, said it had become increasingly harder to fight poaching at the game reserve. “We face a poaching squad armed with the most modern equipment, and we must fight them with standard-issue weapons, so we need more,” he said. He added there were concerns about the psychological welfare of anti-poaching staff – from forensics staff right through to office staff. “Post-traumatic stress syndrome is becoming a problem. This war against poachers is relentless,” he added.